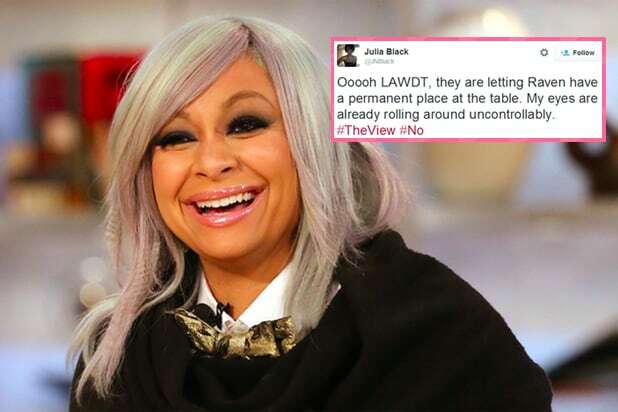 Welcome to the panel of “The View,” Raven-Symone. And also to the wrath of Twitter. After a long-running guest stint on the ABC daytime talk show, the former “That’s So Raven” and “Cheetah Girls” star was named as a permanent co-host on Wednesday. And while Whoopi Goldberg, Rosie Perez and Nicolle Wallace appeared genuinely happy, there was no shortage of trash-talking on Twitter — where, let’s face it, there’s never any shortage of trash-talking, ever. Another user, dubbed Cookie Lyons (not to be confused with the similarly named “Empire” character), essentially accused Raven-Symone of being a stereotype. “Oh. All her shuckin n jivin paid off,” Lyons sniped. Below is a sampling of reaction as compiled by TheWrap. Raven-Symone is gonna be on The View now. I look forward to hearing all the stupid things she's going to say. The fact that Raven Symone used to be the only other Black girl who made me proud to be a Black girl makes me PISSED at her ignorance today. Despite the criticism, other Twitter users said they were “proud” of Symone and “excited” about the announcement. Congrats to @ravensymone on being named permanent co host on #THEVIEW @TheView Just awesome! !